Rental Application – Document used to allow a potential tenant to enter their personal, employment, and financial details in the hope of being accepted by the landlord for housing. The landlord is allowed to charge a fee for this providing this verification. Commercial Lease Agreement – Type of real estate contract for properties located in an area used primarily for business-related use. Space that is usually defined as office, retail, and/or industrial. Lease with Option to Purchase Agreement – A standard lease with an added benefit to the lessee/buyer that gives them the right to acquire the property for an agreed upon price and terms outlined in the document. Month to Month Lease Agreement (§ 4467) – A rental contract that gives either party sixty (60) days to terminate the contract at anytime. If the tenant has been on the property for more than two (2) years the landlord must grant at least ninety (90) days’ notice. Room Rental (Roommate) Agreement – When seeking to live in an arrangement where each person gets a bedroom and share the common areas such as the kitchen and recreational quarters. See the Vermonters Guide to Homesharing for more detailed information on how to construct the agreement. Standard Residential Lease Agreement – Standard form which specifies a commencement and end date for the tenancy. 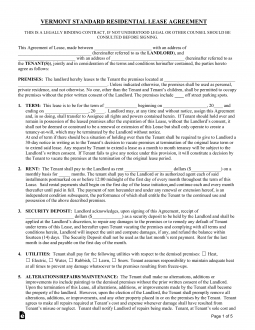 This document is the most commonly used residential real estate contract. Sublease Agreement – For the act of ‘subletting’ such as a tenant that decides to rent their space to another person, the ‘subtenant’, with the landlord’s consent. 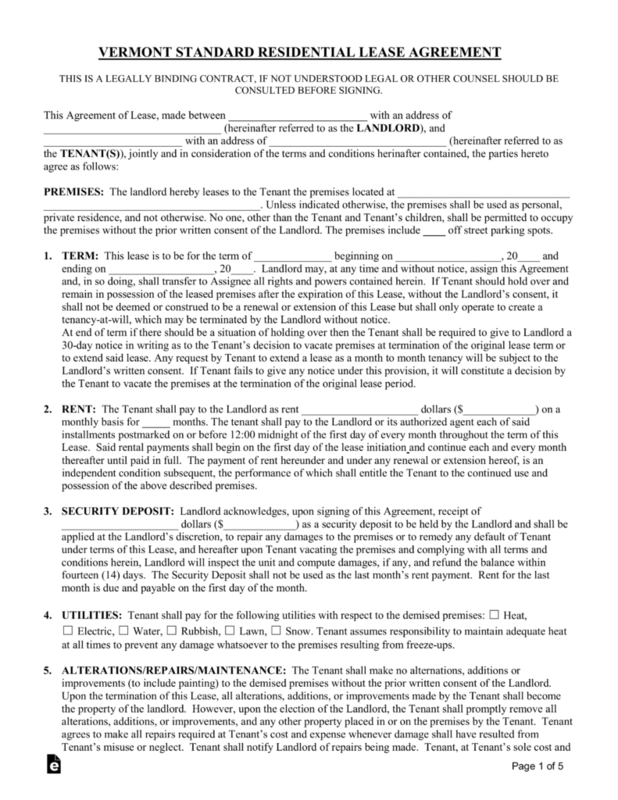 Termination Lease Letter (§ 4467) – To terminate an arrangement that is a tenancy at will. Must be given with at least sixty (60) days to the other party, and ninety (90) days for tenancies lasting more than two (2) years. Lead Based Paint – Law provided by the Federal Environmental Protection Agency (EPA) that requires all landlords of property built prior to 1978 to inform their tenants of lead paint in the walls and ceilings. Must be signed by all new tenants at the time of commencement. Landlord may access the tenant’s property with at least forty-eight (48) hours notice and must do so from the hours of 9:00 A.M. to 9:00 P.M. (§ 4460). Maximum – There is no State cap for landlords on how much they may charge a prospective tenant. Returning (§ 4461) – Within fourteen (14) days of the time the landlord has discovered the tenant has vacated or abandoned the property they must return the deposit. If the residence was used seasonally, not for the intended use of a primary residence, the landlord has sixty (60) days to return the funds.